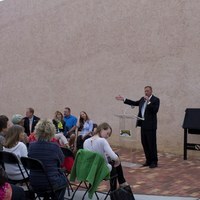 Sanford Mayor Jeff Triplett addressing the audience at a ceremony commemorating the completion of the Sanford Avenue Streetscape and the unveiling of several heritage markers. The unveiling of the heritage markers was held in Paulucci Park, located at the southwest corner of First Street and Palmetto Avenue in Sanford, Florida, on November 20, 2014. 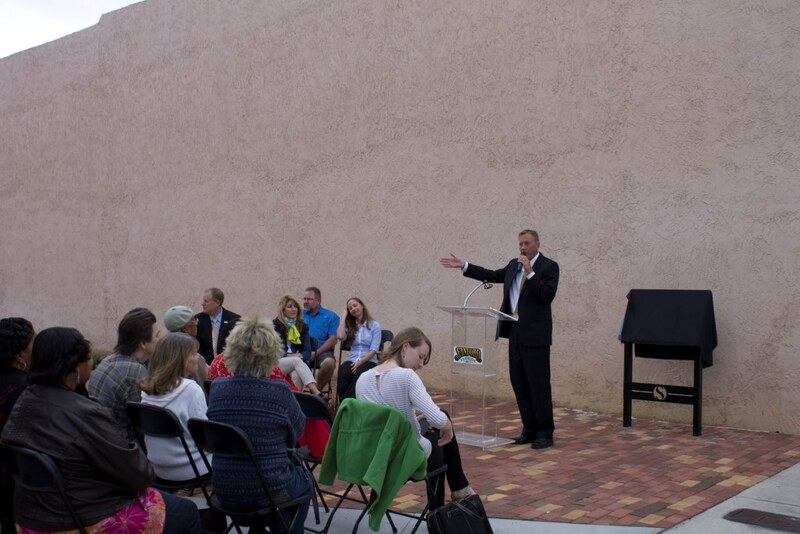 The ceremony was followed by a presentation of the Georgetown Pathways to History Project at the Historic Sanford Welcome Center, locate at 230 East First Street. Pathways to History is a program created by Christine Dalton, Historic Preservation Office for the City of Sanford. The programs consists of eight themed tours showcasing the history and development of Sanford. The event also included a guided tour of Sanford Avenue, which had been the subject of a $3 million streetscaping project, and a reception at the Welcome Center, hosted by the Sanford Community Redevelopment Agency. The Georgetown Pathways to History Project was developed by the Georgetown Heritage Advisory Committee with assistance from the Sanford Museum and Sanford Historical Society. Georgetown was established by the city's founder, Henry Shelton Sanford, as a suburb for African-American residents in the 1870s. The neighborhood spans along Sanford Avenue, with its commercial district between First Street and Fifth Street and its historic district between Seventh Street and Tenth Street. Though originally much smaller, Georgetown spanned to its present boundaries from East Second Street to Celery Avenue and from Sanford Avenue to Mellonville Avenue. Georgetown thrived at its height from circa 1880 to 1940, particularly in agriculture and transportation. Original color digital image by Connie L. Lester, November 20, 2014. Originally created by Connie L. Lester. Lester, Connie L.. “Sanford Mayor Jeff Triplett Sanford Avenue Streetscape Completion and Unveiling of Heritage Markers.” RICHES of Central Florida accessed April 20, 2019, https://richesmi.cah.ucf.edu/omeka/items/show/4655.